I couldn’t be more pleased. It doesn’t sound as good as mine, of course, but it will be fine for now. And they wouldn’t rent me a shoulder rest, so I bought a nice one for myself–fine, since the one I have at home is a little uncomfortable. The total for three months and shoulder rest came to just under a hundred dollars. Thank goodness the owner of the shop was feeling patient, as I flailed around with my suffixes, postpositions and direct objects. Hungarian is exhausting, and my vocabulary is just not that big. Honestly, most of what I know are food words. Nothing quite like gilding the lily, and Hungarian cooks know how to do it. Basically, the cakes are layered with the filling, custard, and rum syrup, and ‘dumplings’ are cut out of the cake base and topped with whipped cream and chocolate sauce. If it sounds like a royal mess, it is. But it’s basically like really extreme tiramisu, so I liked it a lot, and I think Owen would too. Maybe I should mail him some? Please can you make this at home for us? 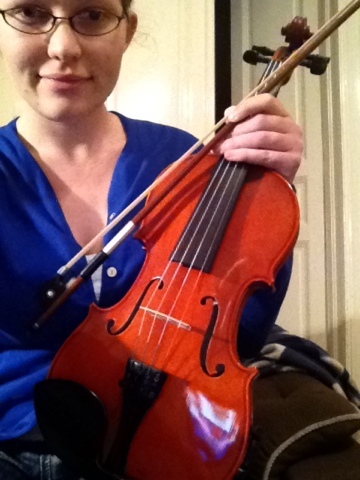 Fantastic; I’m so glad you got a violin!! 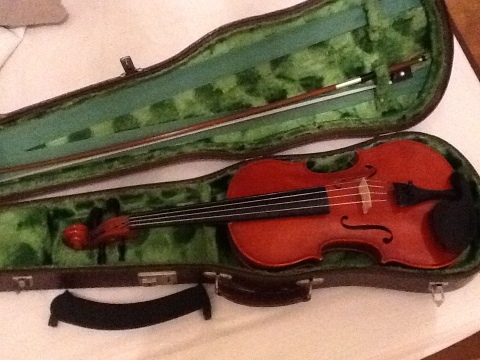 I remember the frustration of breaking and losing shoulder rests from my violin days and then having to shell out like $40 for a new one…I’ve herd that high quality classical recordings are really cheap and easy to come by in some Eastern European countries like the Czech republic. I wonder if it’s the same in Hungary. Or maybe they’re just in to Lizst? Also, the dumplings sound like the most heavenly royal mess ever created in a kitchen. Hurray!!! You have a violin! this many layer cake sounds delicious, now I want to see what I can produce with my gluten free flour mixture! Any chance you could attend a classical music concert?